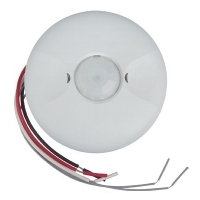 The MPC-50V 360° passive infrared (PIR) occupancy sensors turn lighting systems on and off based on occupancy and ambient light levels. The light level feature keeps lights from turning on if the ambient light level is sufficient. The sensors can be configured to turn lighting on, and hold it on as long as the sensor detects occupancy. After no movement is detected for a specified time the lights are switched off.